Good morning! And what a good morning it is : ) Heather S. here with this week's Sunday Surprise and as I write this post I am sitting on an elevated deck, bayside at Ocean City, MD looking at the most amazing view. Sigh. Will I be able to focus though this post? We shall see. 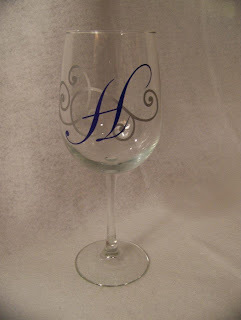 The project I'd like o share with you this week is my latest obsession...wine glass design. I chose this project for two reasons: 1. Shameless self promotion I make these for others and would LOVE to make one for you. Please check out my Facebook page and "like" it if you like what you see : ) 2. If you are willing to learn, I'm willing to show ya how. Vinyl is tricky to work with and people are often scared of it, but I'll see if I can give you a few decent tricks to use to take away some of the fear. 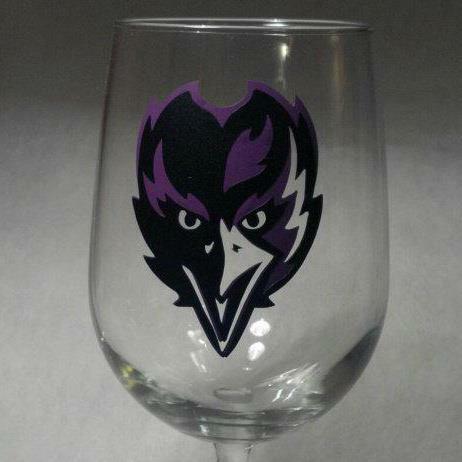 First, working with matte vinyl on glass is one of the most forgiving ways to start with vinyl. If the vinyl wrinkles, its easy to pull back up and re-apply. USE TRANSFER PAPER. Read the directions if you are not familiar with it. Yes... you can use Reynolds Wrap Press and Seal.... Don't do it if its your first try. That's a whole other tutorial in its self. Should I do one? Comment below. Use a paper piercer to keep your fingers off the vinyl. Carefully lift and move edges with the tip. Layering is a beast. Do it BEFORE you place it on the glass, not after and use a light table if you have one. Its not necessary - I get by without it, but it makes things a LOT easier when you do have one. Have questions? Please post them to my Facebook page - I'll be glad to try to answer them for you. Happy crafting!! Love the glasses. 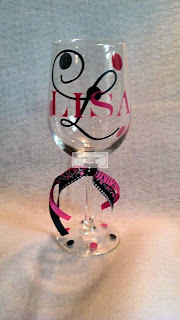 I have made a few items with it and enjoy working with vinyl. Just don't get in a hurry. Thanks for sharing some tips. Very nice! I have got to do my Vinyl Project. I don't know why I'm so afraid of it! Good Job! Nice Job, I like your vinyl project they are pretty. please advise how long the vinyl lasts on the glasses? can they be washed or diswashed?